You might have got the idea that I like making curries. I really do! This one is different from the others in the fact it doesn’t use a pre-made paste. The flavours are based entirely in a gorgeous, thick tomato sauce. If you leave it to simmer with the lid off the pan, it’ll reduce beautifully. This is a very mild curry – garnish it with sliced red chillies to build up heat if you want it – leave off if you don’t! 1 – Warm a few glugs of oil in a large pan. 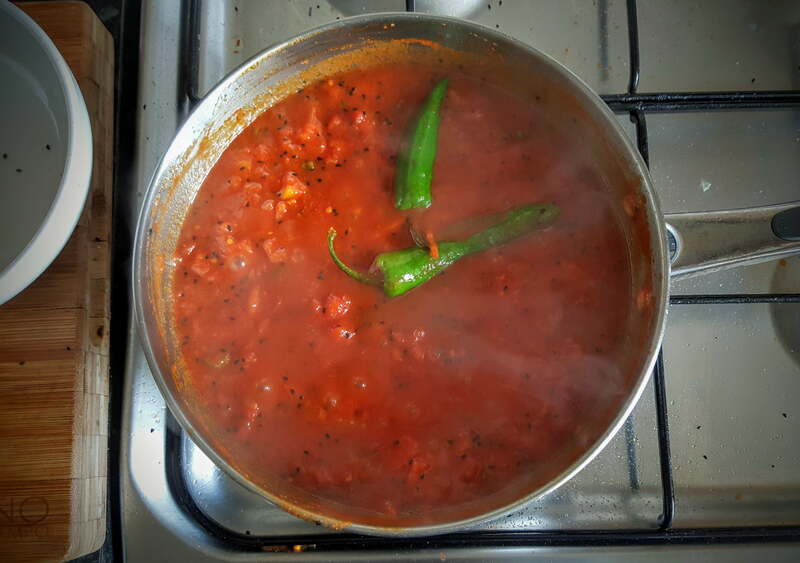 2 – Add the Nigella Seeds, Chopped Tomatoes, Sugar, Turmeric, Chilli Powder and the Chopped Chilli – give it a good mix. 3 – Put in the scored chillies whole, and bring the heat up to a simmer. 4 – Leave to simmer for while and reduce. 5 – Add the Mustard and put in the Mushrooms and stir in well, let the mushrooms cook through. 6 – Season with Salt and Pepper and chuck in the Lemon Juice and Peas. 7 – Ideally the sauce should be thick and rich – if it’s too thick, put in some water to soften. 8 – Serve with rice and top with the chopped coriander, and red chillies if you want some heat. 9 – Enjoy the Bengali Mushroom and Pea Curry!